Long considered the greatest of the so-called “Seven Wonders of the Ancient World”, the Temple of Artemis located in modern-day Turkey consists of nothing more than a single column of marble surrounded by random pieces of debris. Famously destroyed and rebuilt multiple times over the centuries, the temple is most notable for being burned down by a guy who wanted to destroy the great temple for no other reason than to be remembered by history. This is the story of Herostratus. While there is some debate, most historians believe it was originally designed by the famed Cretian architect, Cherisiphron, in 550 BC. The temple was built to honor the goddess Artemis, the deity of – amongst other things – the hunt, wild animals and somewhat paradoxically both childbirth and virginity. Built literally on top of another, lesser, temple dedicated to the goddess that had been destroyed by floods some two centuries prior in the city of Ephesus, this new, much more resplendent temple was constructed almost entirely from gleaming, pearly white marble with support beams of cedar that had been treated with perfumes and oils. The cost of this marble (an exceptionally expensive and difficult material to work with even today) and the construction of the temple itself was absorbed largely by King Croesus of Lydia- a man who is, unsurprisingly, oft described as being “fabulously wealthy” in most historical accounts. To ensure that the temple would stand for as many years as possible, in addition to constructing it from a combination of hard slabs of marble and specially treated beams of timber, the temple was specifically constructed on marshy land. While this may seem counter-intuitive to anyone familiar with the parable of the foolish builders, their reasoning behind choosing softer ground was apparently so that the building would be better protected from earthquakes. To help get around the otherwise inherent problems of building a large structure on marshy ground, the foundation area was supposedly reinforced with tons of charcoal and sheepskins, onto which layers of shale and marble were laid to create a flat surface to build on. For many years, the only source on this bizarre claim was a later account by Roman historian Pliny the Elder, so there was some lingering doubt that this is how they managed to create a solid foundation. Things changed, however, when archaeologists examined the soil around the temple’s ruins and found “remnants of carboniferous elements and various fragments of organic origin”, with further excavation revealing marble chips also used, suggesting that this really might have been what ancient builders did to ensure the temple had a solid, immovable foundation. However, there is still some debate with regards to the use of sheepskins. Whatever the case, the actual time it took to finish building the temple seems to be a matter of disagreement among experts with estimates of how long it took ranging from 10 to 200 years depending on which source you consult. Some of the confusion appears to be that the main body of the temple was constructed in just about a decade, but it was constantly being improved upon right up until 356 BC when it was destroyed by Herostratus (who we promise we’ll talk about in a moment after we talk about how opulent this temple was). Roughly 377 feet in length and 180 feet wide (making it slightly larger than an American football field for anyone having trouble visualizing that, or for another reference, about three times the square footage of the famed Parthenon), the temple’s most impressive feature were the 127 gleaming white marble columns holding up its roof. According to modern estimates based on historical accounts, each of these columns consisted of a single piece of marble over 60 feet long and weighing close to 100 tonnes. Exactly how these columns were erected isn’t clear, which only made the temple more visually impressive to ancient travellers and worshippers, many of whom were simply awed by its sheer size. By all accounts, the temple then stood without major incident for some two centuries as the jewel of Ephesus, until July 21, 356 BC when a mysterious figure identified only as Herostratus decided to burn it all down. Now, you may be curious, given how we’ve just spent some time talking about how immensely huge this largely stone building was, how a single man burned it to the ground in a single evening. It turns out it wasn’t that difficult at all. It would appear Herostratus simply snuck past the guards, placed various oiled rags around some of the wood frame beams helping to support the roof, lit them on fire, and let the magic happen. The destruction of the temple came as a shock to the citizens of Ephesus who’d assumed that the vast temple was largely impervious to conventional damage by virtue of its massive size. What came as an even bigger shock though was when Herostratus openly admitted to the crime and willingly handed himself over to Ephesian authorities. The braggartly arsonist was then almost immediately tortured to ascertain why he’d burned town the temple. While being tortured, Herostratus apparently exclaimed that he did it so that his name would be remembered throughout history. Fearing that copycat criminals would similarly commit acts of arson or perhaps even worse crimes in an attempt to gain enough notoriety to have their name etched into the annals of history, the authorities saw to it that Herostratus was brutally and very publicly executed. After this, all mentions of his name were removed from public record and a decree was issued that anyone who so much as mentioned his name in public would similarly be executed. This is an early example of the practice of damnatio memoriae, which you can read about in more detail here. As you can probably tell from the fact that we’re writing an article about Herostratus two millennia later, the attempt to excise him from history didn’t exactly go to plan largely thanks to the work of the 4th century Greek historian Theopompus who bravely decided to ignore the decree in his work Philippica, to ensure future generations would know the true fate of the great temple and the name of the man who destroyed it. Unfortunately though, Ephesian authorities were remarkably thorough when it came to destroying any and all information related to Herostratus, though this hasn’t stopped historians from trying to infer a number of things about him based on what we do know. For example, it’s largely assumed that Herostratus wasn’t an Ephesian citizen because he was tortured on the rack, a punishment it’s noted was usually reserved for foreigners, leading experts to assume he was either a foreign traveller or perhaps a slave. Of course, it could have also simply been that the level of outrage among the citizens of Ephesus over the destruction of their beloved temple was such that they may have treated his case especially brutally, regardless of whether he was a local citizen. It should also probably be mentioned that some have hypothesized, including none other than Plutarch, that Herostratus may have got the idea to acquire a bit of fame in this way owing to the birth of Alexander the Great who was supposedly born on the day Herostratus burned the temple to the ground. We may imagine, then, that on that evening in 356 BC, as Herostratus passed by the familiar temple, runners from the court of Philip of Macedon were announcing the birth of the prince for whom great things were prophesied. The thought of this child, born into all the advantages of life and predestined for glory, made Herostratus reflect despairingly on his own frustrated ambitions, made him rage against his anonymity, mortality, mediocrity. The idea here being that the announcement of a baby who was already more famous and well-known than he was so annoyed Herostratus that he burned down the largest, most opulent building he could find- The Temple of Artemis. It was this coincidence which inspired Hegesias of Magnesia to utter a joke which was flat enough to have put the fire out: he said it was no wonder the temple of Artemis was destroyed, since the goddess was busy attending to the birth of Alexander. But those of the Magi who were then at Ephesus interpreted the destruction of the temple as the portent of a far greater disaster, and they ran through the city beating their faces and crying out that that day had brought forth a great scourge and calamity for Asia. As fun and widely repeated as this hypothesis is, it should be noted that Ephesus was some 900 kilometres by land, or 500 km or so via the Aegean Sea, from Alexander’s birthplace in Pella. In other words, there was no way for anyone in Ephesus, including Herostratus to know that Alexander had been born before he went and burned down the temple, that is, at least, if we are indeed assuming the two events really did happen at approximately the same time as stated. Further, Alexander was not Alexander the Great as we think of him at this point, so it seems odd that an Ephesian would care in the slightest that some distant future ruler had just been born. That said, some modern historians have speculated that ancient historians may have simply made these two events coincide, as it was something of a popular practice among said historians to put significant events in history together on the same day if they just happened to have occurred reasonably close to each other in time. 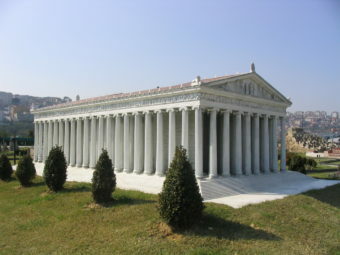 Whatever the case, it is noteworthy that during the rebuilding of the temple, Alexander the Great himself would offer to pay for it if they’d agree to put his name prominently on an inscription on the temple, but, according to Strabo, the Ephesians very tactfully refused, telling him, “it [is] inappropriate for a god to dedicate offerings to gods”, after which they continued to fund the project themselves, supposedly through taking collections from local citizens, including donations of jewelry and the like. That subsequent temple was just as opulent, standing for about six centuries until the Goths sacked the city sometime between 260-270 AD. It isn’t actually clear whether the Goths destroyed the temple or simply took all the valuables from it and damaged parts of it. But either way, whether rebuilt or repaired, its final end would come around 400 AD thanks to the rise of Christianity. It was at this point that its doors were closed and it was either destroyed and its stones used for other structures and statues and other valuables taken, or this just happened gradually over time from there. Many other ancient sources would also ring in, generally noting that the Temple of Artemis was one of the greatest, if not the greatest, structure ever built. But going back to Herostratus, very unfortunately for those of us who like all the details, other than that he apparently had a desire to be famous that was stronger than his desire to not be brutally tortured and die, we don’t really know much of anything definitive about how he came to such a desire for fame. But fame he got- even today some two millenia later, Herostratus lives on in our very language, lending his name to the term “Herostratic fame” which is used to describe the actions of people who commit crimes solely to acquire fame or notoriety. But the iniquity of oblivion blindly scattereth her poppy, and deals with the memory of men without distinction to merit of perpetuity… Herostratus lives that burnt the Temple of Diana, he is almost lost that built it… Who knows whether the best of men be known? Or whether there be not more remarkable persons forgot, than any that stand remembered in the known account of time? Did Nero Really Fiddle when Rome Burned? By who? Every list I’ve ever seen had the Pyramids at Giza a solid #1.